I hated the extended editions of The Lord of the Rings. Loathed them, in fact. In every single instance, I could see exactly why the deleted scenes were originally excised. Shoving such redundant scenes back into the movies made long stretches of the originally great films feel tiresome. Despite many vocal fans that claimed that it was impossible to have too much Middle Earth, I was always of the opinion that the theatrical cuts were the best. So it was with some trepidation that I approached the first Hobbit movie. The knowledge that the book was originally being split into two films made me apprehensive, and the last minute decision to change it to three had me quaking in my boots. Peter Jackson had made it clear that he was going to dip into the appendices from ‘The Lord of the Rings’ but, nevertheless, would The Hobbit films be the equivalent of the LOTR extended editions? I needn’t have worried. For me, An Unexpected Journey flew by, and I loved just about every minute of it. 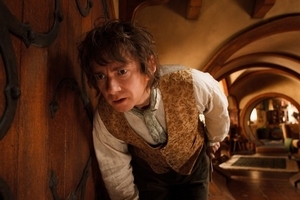 For those who don’t know, The Hobbit is set 60 years before The Lord of the Rings and concerns the halfling Bilbo Baggins, who is press ganged into helping a group of dwarfs reclaim their home and their treasure from the great dragon Smaug. Gandalf’s along for the ride, and several other characters who popped up in LOTR appear here also. Being a children’s book, it’s a smaller tale, but it’s also one that constantly hints at events just out of the novel’s reach. Peter Jackson, of course, willingly dives head first into such events, and this is what prevents the film from feeling like a small story stretched into three hours. Jackson has made it clear that Martin Freeman was the only person he ever wanted to play Bilbo, and he is indeed perfect in the role. At first, I found his performance off-putting because it felt too much like Freeman on autopilot (especially in comparison his brilliant turn as Watson in the modern day ‘Sherlock’) but he soon showed a depth of character that was only ever hinted at in the book. The returning performers are of course great, and whilst there are too many people playing dwarfs for me to list them all, special reference should be made of Richard Armitage, who manages convey a sense of gravitas as Thorin Oakenshield. For those who care about the cinematic technology on display, I saw the 48 frames per second version in 3D. For the first 15 minutes or so, like many other viewers, I was horrified. The image is indeed reminiscent of low budget television at first glance, and to my eyes that are used to 24 fps, it felt like everyone was moving slightly too quickly. But then, gloriously, I warmed to it. The almost complete lack of motion blur was wondrous, particularly in the wide shots. For years now, it’s annoyed me when a camera pan across a digital matte painting led to a blurred image, a flaw that was even more apparent in 3D. With the 48 fps version of An Unexpected Journey, this is a problem no longer. By the time we’d reached the climax, I was well and truly in love with the image. The same goes for the overall tone of the film. It does sit awkwardly between children’s pantomime and dark fantasy, but I came to love the fact that it wasn’t afraid to be a little silly every now and again. Jackson’s sense of the ridiculous hasn’t lessened, so whilst proceedings don’t get as OTT as, say, the dinosaur stampede in King Kong, there are some pretty outlandish moments. The only drawback is that at times it’s hard to believe that our heroes are ever really in that much danger. I was really genuinely surprised how much I enjoyed this film. In the final analysis, it does have its flaws, but I thought it was much more entertaining than The Two Towers, which has always been a struggle for me to get through. We will never know what An Unexpected Journey would have been had Guillermo del Toro remained at the helm, but it’s safe to say that the franchise is in good hands with Jackson. When your last series of films was as critically acclaimed and beloved by audiences as Peter Jackson’s The Lord of the Rings trilogy from the start of the last decade, there is very litle room for misstep in returning to the tale – just ask George Lucas. It is this situation that faces Jackson with the first of a planned trilogy of film adaptations of J.R.R. Tolkien’s ‘The Hobbit’. 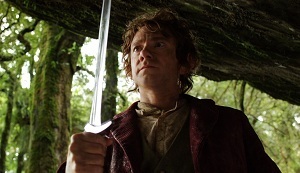 While he doesn’t quite hit his target, The Hobbit: An Unexpected Journey is about as good as one could hope for it to be. Sixty years before Sauron’s One Ring came to Frodo Baggins and he set off to save Middle Earth, his uncle Bilbo lives a quiet life at Bag End in Hobbiton, The Shire. His idyllic life of pipe smoking and frequent gustation is interrupted one day by the return of Gandalf the Grey, a wizard of whom Bilbo can only recall is capable of wonderful fireworks displays. The further arrival of twelve dwarves on his doorstep – right in the middle of his evening meal, no less – will mean Bilbo has a hard decision to make: will he stay at home enjoying his comfortable lifestyle, or take up the company of dwarves on their offer of an adventure? There are many, many things that Jackson and his incredible production team get right in this instalment, not least of which is the casting. Of course, they had an advantage in that many of the performers are inherited from the Lord of the Rings trilogy, but the new characters in this series are brought to life by an assortment of actors who never miss their mark. Martin Freeman is the obvious stand-out: he is the focus for almost the entire running time, and is perfect for this role. 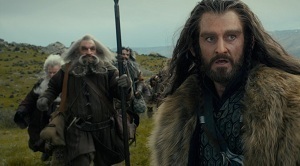 Freeman is ably supported by Richard Armitage as Thorin Oakenshield, leader of the dwarven company, Ken Stott as Balin, James Nesbitt as Bofur, and Aidan Turner as Kili. The remaining dwarves are often difficult to differentiate, and this is perhaps the first of the flaws that beset the film. Fourteen members of the company is an awfully large number of characters for their audience to keep clear, and many are given so little time on screen as to be indistinguishable. The abovementioned technical points are well-made, although there are problems with both the standard 2D version as well as the 3D 48fps version being shown at selected cinemas. The 2D version suffers from occasional blurred backgrounds that mean this visit to Middle Earth might not be as effective at generating business for Tourism New Zealand as its predecessors. The 3D 48fps edition looks amazing in steady close-ups of faces, for example, but has the negative effect of accentuating the worst of Jackson’s decisions: the use of rapid-fire editing and unsteady camerawork for his action sequences. Both editions have action sequences that are an incomprehensible mess, but this problem is amplified in 3D 48fps. 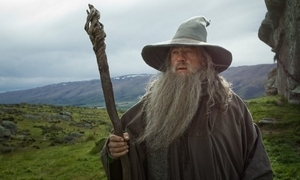 Those hoping The Hobbit trilogy will sell resistant audiences on the merits of 3D might be sorely disappointed. Jackson also seems to have been unable to resist his darker urges, and there are several scenes that move beyond exciting, past exhilarating and into the ridiculous. The goblin escape is the worst example of this, with one part of the sequence so utterly absurd as to be laughable. Radagast the Brown’s rabbit sled brings to mind the awful Quidditch scenes in the early Harry Potter films. The final scene, meanwhile, is an unfortunate smack in the face for anyone who has ever seen a monster film before, with Jackson choosing to end his film with a shot that has been repeated so many times as to be a cliché. Finally, in his attempt to be ‘true to the novel’ Jackson is burdened by its worst flaws, a fate shared by many filmmakers before him and a constant risk when producing films based on other media. His most crucial sequence is resolved by a deus ex machina that won’t surprise anyone who has seen the same trick being pulled in The Return of the King. Had this been an original screenplay one imagines there would have been fewer dwarves, and their constant escapes from danger unscathed would have been rewritten to kill off at least some of the lesser of the bunch. There is much to be enjoyed in this big screen adaptation of Tolkien’s ‘The Hobbit’, but there are problems that mean it can’t claim the same stature as The Fellowship of the Ring or The Return of the King. A cracking good time is on offer, however, and The Hobbit: An Unexpected Journey is – despite some caveats – recommended.